IPAG addresses stellar and planetary formation, from the initial phases of the core collapse where molecular complexity builds up, to the circum-stellar disk physics and chemistry and planets formation, including star-disk interaction via the star magnetosphere. IPAG works on the physical processes implied in accretion-ejection phenomena around young stellar objects, and compact objects where high energy and relativistic effects are involved. In planetary sciences, IPAG studies sun-earth interactions, planetary sub-surfaces, solar system small bodies, and the chemical evolution of the primitive matter. To address these astrophysical questions IPAG is involved massively in the scientific exploitation of national and international facilities (VLT, VLTI, CFHT, IRAM, Herschel and Planck satellites…). Most of the needed observations are very demanding in instrumentation developments for which the detection performance brings one of the most critical limits. IPAG works on cutting edge instrumental developments. IPAG is involved in the construction and also as Principal Investigator of numerous ground-based instruments (NAOS, WIRCAM, SPHERE, AMBER, GRAVITY, PIONIER) that equip the most powerful international telescopes in the world (VLT, VLTI, CFHT). IPAG develops and exploits space probes to study the internal structure of solar system bodies (ROSETTA, ASSERT), the subsurface waters on Mars, the Titan’s atmosphere composition. IPAG has also for a long time a strong R&D expertise to prepare new generation instruments. Most of these developments address optical micro-technologies including detectors and integrated optics. IPAG is a founding member of CSUG (Centre Spatial Universitaire Grenoblois), an academic facility to foster the use of miniaturized components and nanosats in space, taking advantage of the local high-skill businesses. The Institut Néel is a unit of the CNRS Institute of Physics. Situated in the scientific centre at Grenoble, it consists of 19 high-level scientific teams. Institut Néel is rated A+ by the AERES evaluation committee. It possesses a long tradition of knowledge and know-how in the field of very low temperatures. It is one of the main partners in the Planck space mission (ESA, launched in 2009) to measure the cosmic microwave background. It undertakes important and well-recognized activities in instrumental research for astrophysics, with the Edelweiss and EURECA experiments for the direct detection of dark matter and the NIKA instrument for IRAM. Through these original experimental developments, Institut Néel has several experiences of successful technology transfer to companies (Air Liquide, CryoConcept, NEXANS, ABB, etc.). One leading scientist involved in the LabEx program is Alain Benoit. In 2002, he was the principal investigator of the ARCHEOPS experiment, a balloon-borne telescope to map the CMB. Funded by the CNES, it produced the first CMB map at high angular size and validated the PLANCK instrumental concept. He is currently conducting the NIKA instrument development, a new-generation imaging instrument for IRAM which is based on up-to-date MKIDs low temperature detectors arrays. Alain Benoit received the Louis ANCEL prize from the French Physical Society in 1994 and the Jean RICARD prize in 2003. He is member of the ‘Académie des sciences’ since 2002. The “Laboratoire de Physique Subatomique et de Cosmologie de Grenoble” (LPSC)” is a operated jointly by the CNRS (IN2P3 and INSIS) and two of Grenoble’s Universities UJF and INP). The laboratory staff is composed of about 225 people (40 CNRS researchers, 27 University researchers, 100 ITA, 35 PhD students and 25 post-docs or temporary technical positions). The annual budget (including salaries) of the lab is around 13 M€ and the sources of funding are diverse, including ANR, regional contributions, European Frameworks, international exchange programs, technology transfer and patent royalties. The LPSC has been rated A+ after the recent review of AERES, with special notices on the management of the laboratory and its projects. Our laboratory is involved in several scientific or technical projects driven by large international collaborations ; let’s quote for example Particle and Fundamental Interactions experiments (ATLAS at LHC), spatial missions (Planck), and balloon experiments (Archeops) for cosmology. Another important feature of the laboratory is cross-disciplinary physics. Finally spin-offs arise from the knowledge and know-how acquired by the members of the lab like teaching tasks in the UJF and INP universities in Grenoble and technology transfer, consulting and know-how for various fields such as electronics and computing. All this work leads to a strong publication rate (more than 500 published papers and 75 invited talks in conferences, over the last 4 years, and an h-index of 78), as well as numerous distinctions of various domains in research, techniques and valorization. The laboratory is also attractive with a large number of PhD students and postdoc positions as well as candidates on positions open. The LPSC is highly involved in the study of the Cosmic Microwave Background (CMB) physics, with the Archeops and the Planck satellite experiments and on the preparation of the new generation of CMB satellites. Within this context, FOCUS will help LPSC to develop a full experimental research project and expertise on the new generation of detectors needed for observational cosmology and astrophysics. The Laboratoire d’Astrophysique de Marseille is a joint research unit of the CNRS-INSU and the Université de Provence. Located in a new building on the Chateau Gombert campus since 2008, LAM undertakes research in astrophysics and instrumentation, with about 50 researchers, 75 engineers, technicians and administrative staff, 15 post-doctoral researchers, 18 doctoral students and 20 contract employees. LAM participates to major international research projects, with 3 main themes : (1) Cosmology and the study of the formation and evolution of galaxies and large scale structures, (2) the formation of planetary systems, and (3) new instrument concepts for next generation large telescopes. The research teams lead and participate to large observing programmes in cosmology and formation and evolution of galaxies (COSMOS, Herschel, GALEX, VIPERS, VVDS), in exoplanet searches (COROT) and solar system exploration (ROSETTA, SOHO). With its strong technical division and R&D team in Optics and Instrumentation, LAM prepares and develops forefront instrumentation for the largest space and ground based telescopes (SOHO, ISO, Galex, Rosetta, Herschel, Corot, VLT/VIMOS, VLT-/, E-ELT-M1, E-ELT-EAGLE, E-ELT-EPICS) under contracts with the national and international agencies (CNRS, CNES, ESA, NASA, ESO). These teams have succeeded in obtaining 5 ANR grants and 1 ERC advanced grant over the past 4 years. National and international prizes have been awarded to several members (French Academy of Sciences, American Astronomical Society, Greek Academy of Sciences). Scientific animation is very active with large international conferences (bi-annual cycle of Cosmology Conferences in Marseille), workshops, invited researchers, seminars, café club, etc. Research projects are supported by important technical capabilities. The CESAM (Centre de données astrophysiques de Marseille), is a new data center focused on the production of data in open access through the Virtual Observatory. New technology platforms have been setup to support the R&D and instrument development : SPATIAL (cryo-vacuum down to 4K and vibrations dedicated to assemble, integrate and test instruments in space environment conditions (cryo-vacuum down to 4K and vibrations) and POLARIS, a 2.5m polishing machine capable of producing highly aspheric optical elements. These platforms are open to LAM teams as well as to external laboratories or companies. For what concerns this LabEx, LAM is leading a Work Package on ‘Optical Components with Extreme Aspheric Optics’ in the framework of the OPTICON programme (FP7). Theoretical (Bernstein polynomials) and simulation (plug-in to the Zemax optical design software) tools are developed for designing and optimizing high throughput instruments using highly aspheric surfaces. Meanwhile, options for manufacturing these surfaces are investigated. LAM has internationally recognized expertise in optical fabrication, using stress polishing and active optics techniques. These activities have been and are supported by major contracts with e.g. CNES and ESO. Finally, LAM has a renowned expertise and leadership position in the development of fast and high performance detector controllers, which has led to the development of the OCAM camera and to the spin off company First Light Imaging. This development was also awarded the prize of the best engineer of the year 2009 in science. IMEP-LAHC created in 2007 resultes from the merging of the former IMEP and LAHC laboratories, respectively at Grenoble INP and University of Savoie. The laboratory incorporates 200 persons, among which 70 are academics. The laboratory activity is devoted to electronics, spreading from the physics of basic components to telecom systems, including optoelectronics. In the optoelectronics department, a team (nowadays 7 academics) is working on THz optoelectronics since 1994. The team, which was a THz pioneer in France, has produced outstanding results, mostly in THz time-domain spectroscopy (TDS) and electro-optic sampling. Recently, the team was a partner in 2 projects devoted to the design and manufacturing of THz video camera, namely TeraEye (IP, EC FP-7) and an industrial project with Thales ED and LETI/SLIR. Currently, the team is still working on smart THz detectors, like bolometers with LETI/SLIR and nanotransistors (France-Japan ANR program). Most of these projects are related to security application and to THz telecom systems. The participation of IMEP-LAHC to the LabEx project will open the project to mass market applications and development in the THz domain. Our contribution will focus on using the high-tech array detectors developed for radio-astronomy and space research for common applications. For such applications, the amazing sensitivity and NEP of these devices is not necessary. Thus even a degraded version of the detector array would be over the requested performance threshold for common applications, like imagery for security. Even more, the working temperature could be increased to several K or tens of K, which is nowadays easily reachable by compact and closed-cycle cryogenic systems, well adapted to people applications. IMEP-LAHC will take benefit of its former experience in the TeraEye project, in which a similar study was performed, using quantum-dot detectors with an almost single photon detection capability, in view of designing a colour video THz camera for airport gates. Unfortunately, the technology of such QD detectors was not enough mastered and this camera did not reach the expected performance. In the present LabEx, the knowhow of the different partners, as well as the different technologies for making the mm-wave detectors, will insure a good chance of success. At IMEP-LAHC, this participation to the LabEx is important in the sense it will allow us to apply our experience and knowledge in THz science to industrial developments. As an academic laboratory working in applied physics, our scientific policy is based on the complementary between fundamental researches, applied researches and transfer to the industry. During the last years, in the THz team, we have registered an average of 1 patent per year, and 2 start-ups were created. The second contribution of IMEP-LAHC to the LabEx consortium will be the precise characterization of the THz response of materials and devices. Presently, we are able to measure the refractive index and the absorption coefficient of materials with a record precision over the range 0.1-4 THz, using different THz-TDS set ups (transmission, reflexion, polarimetry, goniometry, pump-and-probe…). We propose during the LabEx duration to build another set up with a bandwith extended up to several tens of THz, i.e. covering both the IR and THz ranges. Also, new devices may be studied, like a compact SWIFT interferometer for the THz range. LETI (Laboratoire d’Electronique et de Technologie de l’Information) is an Institute from « Direction of technological Research » (DRT) from CEA. It is based in Grenoble. Its activities focus on nano and micro-technologies focusing on applications such as telecommunication systems, things of objects, health and biology, photonics and energy. The nano-electronics and microsystems form the LETI’s core technologies which are supported by a state of the art 8,000 m2 technological platform running 200 mm and 300 mm wafer pilot lines. This enables validation of new concepts up to full prototyping. LETI clean room contamination protocol has been audited and has passed more than 10 industrial partners test validation leading to easy transfer of innovative technologies. The LETI’s budget is of 250 M€, of which 40 million is spent in equipment in order to sustain premium technological research. Over 75% of LETI’s research is aimed to benefit our industry and is strongly protected by the LETI’s supportive campaign towards intellectual property. Its industrial partners thus have an undeniable competitive advantage. The LETI’s overall portfolio of patents amounts to 1,700 families of which 40% are licensed. In 2009, 283 patents were submitted. The LETI gathers 1,700 people together, 1,100 of which are permanent CEA employees and 200 are detached from the industry. The LETI is the main member of the MINATEC and, more generally, of Grenoble’s technological hub based at the "Polygone Scientifique" and in the university campus. The LETI trains 200 post-graduates and, along with its MINATEC partners and the INSTN, it participates in many professional trainings and summer internships. 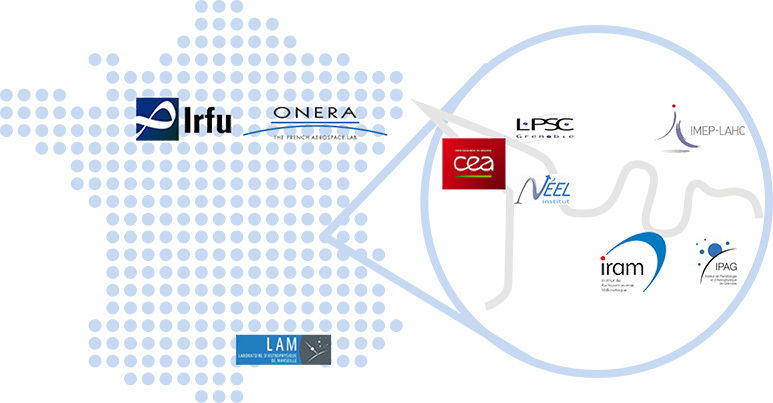 The LETI develops its partnerships with its 33 industrial partners within common laboratories and research teams. The total industrial budget (common laboratories, bilateral agreements in R&D, licensing and services revenues) was of 65ME in 2009. The LETI actively participates in many demonstrations aimed at widening the market for the use of nanotechnologies. Its innovative platform, the “MINATEC IDEAs Lab” symbolizes this opening by including the news users into the research process for future uses of nanotechnologies. The LETI’s mission is to provide results regarding the mid and long term industrial use of nanotechnologies or, in other words, to "Create innovation and to transfer it to the industry". Split into 6 different departments, the LETI is active in the domain of Microelectronics & Microsystems, Technology for Biology and Health, Optoelectronics, System Integration, Design & Embedded computing. The optronic department (DOPT), where most of the LabEx actions will take place, is developing micro-technologies in the field of optics and optoelectronics based on its unique expertise in alternative materials such as non silicon semiconductors. Specifically, LETI-DOPT has been involved in cooled infra red detector development for more than 30 years. This high performance technology based on MCT material has been developed for defense-orientated imaging system. Throughout those 30 years, LETI-DOPT has developed state-of-the-art components and is still tackling technological challenges in this field. •	3D imaging using new electronic functionalities for active imaging (LIDAR). •	Avalanche photodiode structure for photon detection. LETI DOPT has been involved in few space missions by providing detector arrays. Thus, Isocam FPA, Cassini IR spectrometer array and more recently Herschel far infrared bolometer FPA for IR spectrometer are some of the development and manufacture made for space mission at LETI. Several breadboards have also been developed such as HRTIR1 & HRTIR2 with Astrium. LETI-DOPT was also involved in Bepi Colombo project through micro-bolometer FPA feasibility demonstration for MERTIS device. All this know-how and excellence in imaging will find in the frame the LabEx a stimulating environment to help French astrophysics community maintaining its leadership position in universe and earth observation. The Astrophysics division of CEA (SAp) is a department of Institute of Research into the fundamental laws of the Universe (Irfu) located at the CEA Saclay center. It is hosting about 200 astrophysicists, engineers, technicians and PhD students. Most of the staff of SAp is in the laboratory of Astrophysics, Instrumentation-Modelisation, at Paris Saclay (AIM), which also host researchers from CNRS and Paris-Diderot University. Astrophysics at CEA began in the early 60s in conjunction with the advent of space research activity in France. Indeed, on one hand, CEA had developed a broad expertise in instrumentation for detecting X and γ radiation ; on the other hand, the access to space had just opened up X-ray and γ-ray observations of the cosmos, so that a few pioneers from CEA propose to put instruments on rockets ; it was the beginning of a partnership between CNES and CEA which continues today. A major turning point has happened in the 80’s under the visionary impulsion of C. Cesarsky. Indeed the laboratory diversified towards IR space observations and triggered the development at LETI of novel FPAs for astrophysics. The laboratory is involved in many space missions (in exploitation : SOHO, CASSINI, XMM, INTEGRAL, Herschel ; in realization : JWST ; under study : Solar Orbiter, Euclid, SVOM, Athena, ECHO, LOFT, NEAT), as well as ground-based instruments (leading the CFHT/MEGACAM camera (2003), the ESO VLT/VISIR instrument (2004), the APEX/ARTEMIS camera (2013) and being part of the E-ELT/METIS consortium). Current researches at SAp deal with the energy content of the universe, the structuration of the Universe, the star and planet formation, the stellar evolution, the study of compact objects, of cosmic rays and benefit from state to the art numerical simulations. When Irfu has not yet been evaluated by the AERES, the excellence of SAp has been recognized in many regards : 5 European Research Grand (4 junior and 1 advanced), 1 CNRS Silver medal, 3 important prizes from the French academy, 20 ANRs (leading 10 of them)). More than 200 articles are published a year. CEA is a great place to develop novel focal plane arrays for astrophysics. Indeed, given that at CEA no difference is made between the careers of researchers and engineers, it is quite easy for an astrophysicist to work on instrumental developments. Moreover, CEA is a great technical research center with superb technological facilities. The link between LETI and the CEA Astrophysics division was made in the 80s, and several common developments were achieved on a case-by-case basis (ISOCAM, CIRS, PACS, ARTEMIS). The sharing of the tasks is the following : technological developments at LETI and system activities as well as scientific characterization at AIM. The LabEx will bring several key advantages ; it will ensure a continuous link between Astrophysics and technology at CEA ; it will allow anticipating the technological needs, at a time when there is a key change in the way space missions are selected. Indeed, in the past it was possible to develop novel detectors at the same time as the project itself ; nowadays the need for a high Technical Readiness Level (TRL) at the time of a selection of a project makes necessary to develop technology well in advance. In that sense, the LabEx is very timely. The label will also be a key element to get funding for the developments of FPAs, which are costly. 12 people of AIM will be part of the LabEx Focus, most of them full time. The AIQUIDO Lab (AIQUIDO meaning Analyse, Interprétation, Qualification et Intégration de Détecteurs Optiques) is in charge of the orientation of emerging IR technologies for the DGA, but also has its own research activities concerning optical detectors from the UV to the IR spectral domain. One of our goals is for example to understand the fundamental phenomenon involved in the detection of IR radiation. Thus, our field of expertise is far broader than defense applications. It includes for example astrophysics applications, which share the need for extremely high performance FPAs. Since 1992, the AIQUIDO lab has helped to the definition of challenging sensors, such as the Si:Ga FPA of the VLT (10K operating temperature), dedicated to observation under very low incident power. Recently, the same cooperation has been established for APD sensors. In order to fulfill the scientific objectives of both defense and astrophysics applications, the AIQUIDO lab has developed out of the ordinary test benches to address new types of measurements. This includes measurements at very low operating temperature (down to 10K), measurements under very low incident powers (such as those relevant for astrophysics applications), measurements of very low dark currents (down to 10 attoamperes) or measurements of very low levels of noise and fine measurements of spectral and spatial responses based on Fourier techniques (Fourier spectrometry and MTF measurements by use of self-imaging targets). These developments have allowed the AIQUIDO lab to follow and anticipate the amazing technological advances in microelectronics that lead today to the production of infrared FPAs (IRFPA’s) for high-performance applications (megapixel format, bispectral technology) but also for low-cost and high-manufacturing volumes (technology of uncooled micro-bolometers). The next step is to reduce the optics and make it compatible with the successful IRFPAs fabrication technology. Some methods and technologies are explored in our laboratory for high-performance and small infrared systems (micro-cameras and micro-spectrometers). These developments have led to a toolbox of micro-concepts described by an optical function (imagery, spectrometry or wavefront sensing) integrated onto the IRFPA. The reason why ONERA is so keen on participating to this LabEx project is the fact that the very challenging detectors that will be realized will allow us to further understand the fundamental aspects of IR detection. We believe our know-how will allow us to realize the test benches required to make the appropriate electro-optical measurements on these detectors and to propose new optical architectures of instruments that exploit the full capabilities of these advanced detectors. IRAM is a leading institute in millimeter wave astronomy with administrative and laboratory headquarter in Grenoble/France. IRAM operates two world class facilities, the 30m telescope in southern Spain and the PdB interferometer in the French alpes. IRAM is a collaboration between CNRS France, MPG Germany and IGN Spain. The IRAM superconductive device group develops and fabricates superconductive detectors for millimeter and submillimeter wave astronomy. The main goal is to achieve ultrahigh quality SIS junctions for the application in SIS mixers. These junctions are used for IRAMs own observatories but also for numerous other space and groundbased observatories like Herschel Space Observatory, SMA, APEX, JCMT and others. Lately the fabrication of SIS devices for ALMA has been a major occupation. Other developments cover hot electron bolometers, cryogenic RF-MEMS and millimeter wave meta-materials. During the last years IRAM has been heavily involved in the development of kinetic inductance detector arrays (NIKA collaboration) with world leading results. It is within this context the IRAM superconducting device group intends to participate in the LabEx FOCUS program.